Roger Jourgensen has the same feeling now, as an adult reading this intelligent assessment, that he had as a child, watching the nuclear powered bombers sleeping in their concrete beds. There’s a blurry photograph of a sleeping giant pointed at NATO, more terrifying than any nuclear weapon. "Warning. The following briefing film is classified SECRET GOLD JULY BOOJUM. If you do not have SECRET GOLD JULY BOOJUM clearance, leave the auditorium now and report to your unit security officer for debriefing. Failing to observe this notice is an imprisonable offense. You have sixty seconds to comply." The biggest single threat to NATO may be the Shoggoth Gap. The wild card is Lt. Col Oliver North, President Reagan's man. Roger Jourgensen, CIA operative, is at the center of this crisis. If all the political wrangling doesn't work out perfectly there will be hell to pay, or worse, far, far worse. Brilliant! Absolutely brilliant! A modern novellete in H.P. Lovecraft's Cthulhu Mythos, rich in detail, frightening in execution! Stross' stunning tale will pull you back into that old cold war era embalming fear and then magnify it into non-euclidian infinities. Imagine David Cronenberg directing Dr. Strangelove based on a script by H. P. Lovecraft. Imagine an alternate history in which nuclear bombs are not the ultimate weapon, but instead they are merely a stepping stone to eldritch technologies accessible through certain trans-dimentional forces first encountered in 1920s Antarctica, technologies which neither the USA nor the USSR can quite contain. Stross has admitted A Colder War is directly inspired by Lovecraft's novel At The Mountains Of Madness. The amount of research and historical mastery Stross sprinkles throughout the narrative creates a verisimilitude necessary for truly effective alternate history. Insert the CD and then shudder in horror as the concept locks you in for the duration. Pat Bottino's tremulous voice isn't at all typical for professional narrators, but when it comes to subverting heroic self-assurance, he's got no equal. Here it works extremely well. The production is loud and straight, the way I like it. A few voice effects are used to distinguish documentation bookmarks of each section. Nothing flashy, nothing distracting. I'd be satisfied if every straight reading single narration audiobook was done this way. For a while now I've been telling just about anyone who would listen that editor and producer Allan Kaster at Infinivox has been picking out the best modern short science fiction and turning it into fabulously read audiobooks. 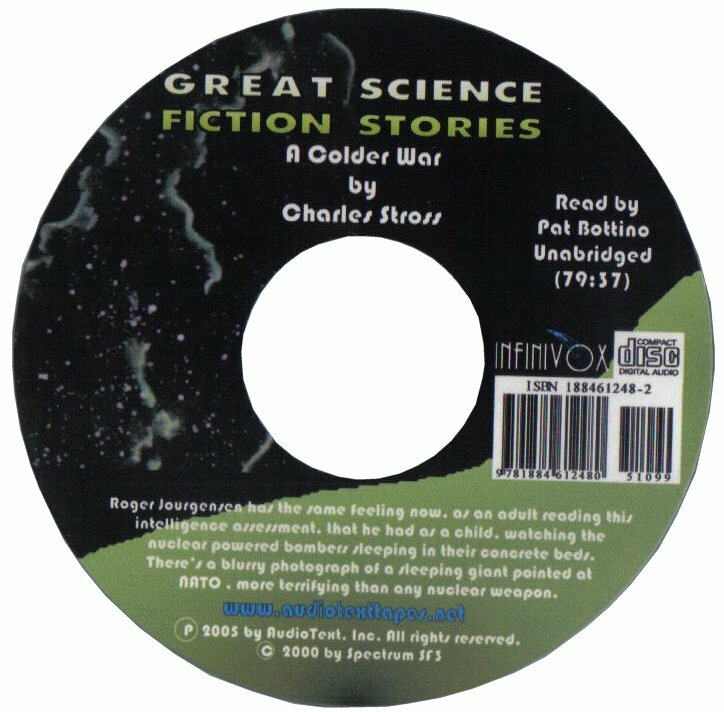 This latest wave of Infinvox's GREAT SCIENCE FICTION STORIES includes three Charles Stross audiobooks. Lobsters, Antibodies and A Colder War. Each of these is available for just $7.99 right now on the Infinivox website. There's nary a better value on the web!